While the department, grocery and big box stores are already stocked, ready and have you thinking ahead to Christmas, I am going to bring you back in time. We'll only go back a few days. But I'm not ready to zip past Thanksgiving and embrace the big winter holiday just yet. How could I? 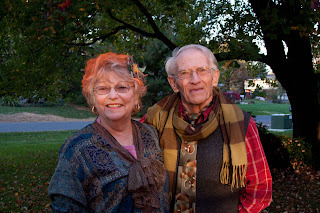 I haven't told you about our Halloween celebration yet. 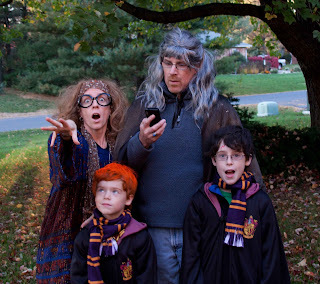 After last year's Harry Potter masquerade, I felt we had a challenge ahead of us this year if we wanted to better our costume showing. How could we improve on this? We even hired extras to go along with us as Mr. & Mrs. Weasley. 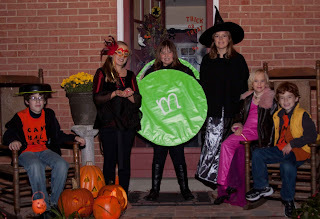 Let me preface this whole thing by telling you up front - we did not exceed last year's high level of clever costumery. We failed. Lack of cohesion was our downfall. 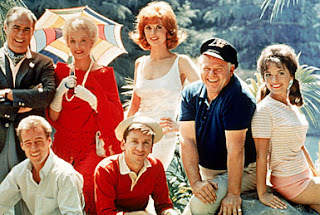 I had some grand ideas for our family costumes, the best being to dress as the partial cast of "Gilligan's Island." Then the fight ensued..."I'm Gilligan!" "No, I'm Gilligan!" My suggestion that there be two Gilligan's was promptly shot down as a terrible idea. That's not possible, they said. Being so young, inexperienced and unfamiliar with Gilliganology, they didn't know that there were in fact two Gilligans at one point. They didn't recall the episode "Gilligan vs. Gilligan" in season 3. You know the one with the Soviet agent sent to discover the castaway's true mission? It happened. 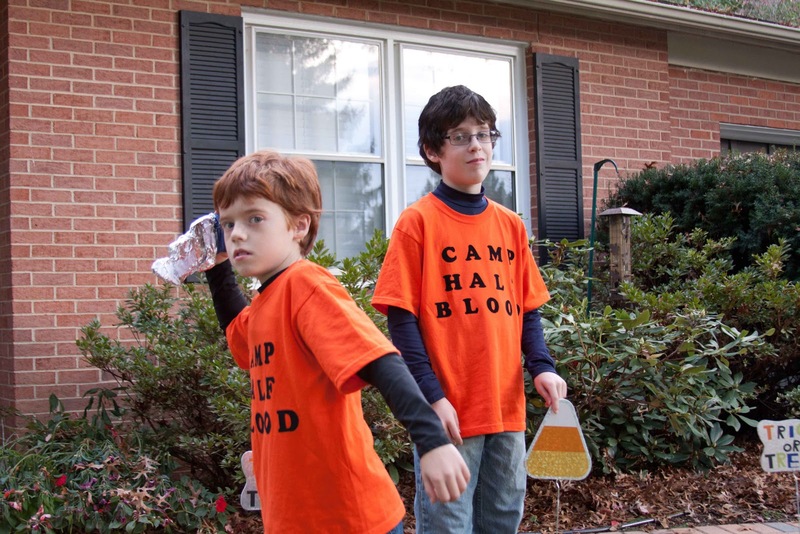 The Gilligan costume argument was so heated, the kids revolted and decided to go out on there own. By "revolted" I mean, they decided not to dress up as a group with their parents. Lack of cohesion killed the groupthink. Hubby and I were voted off the island so to speak. Which gave me another great idea: my husband could dress as an IT executive who was dressed as a Survivor contestant. So we raided his closet for a threadbare dress shirt and slacks, ripped and shredded them a bit, then rubbed them on the garage floor to emulate the dirtiness of tribal living. We made a buff. He wore a fake immunity idol and he carried a backyard tiki torch. Perfect. Sadly, there are no pictures to record this fabulous costume. Photographer, how did that happen?! Now that the husband's costume was taken care of, I had to come up with something for myself. I wasn't about to go as a female Survivor contestant. I am not a twenty-something that could strategically wear a buff to cover all the important parts. 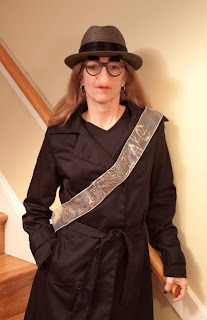 And while I am a forty-something, most people don't enjoy looking at the forty-something female Survivors, no matter where they wear their buffs. Isn't that great?! You know what I am, don't you? I knew you would get it. Strangely, every person who actually saw me at the two Halloween parties to which I wore my costume did NOT get it. What? You actually don't get it either? You were just being polite? Okay. Let me help you. 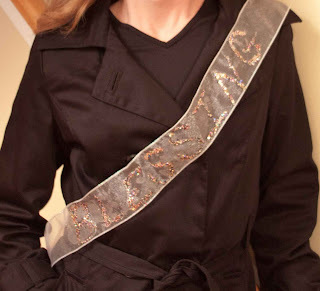 Maybe it would help if you could read my sash better, although the folks at the parties had no trouble reading my sash. It says, " Blessings." Yeah, I didn't think so. I'll just tell you, like I did all those party folks. I'm a "blessing in disguise." Apparently, dressing as an idiom is not as clever of an idea as I thought. It sounded so much better when I read it on the internet really late that night, the night before the party when I was running out of time. Maybe it was the idiom itself that made it an epic fail. 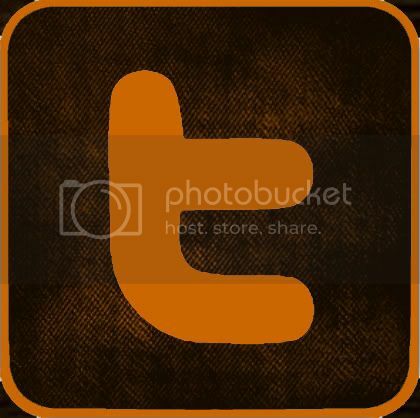 Maybe the "bird in the hand is worth two in the..." idiom would have gone over better. I don't know. Anyway, back to kids and their revolt. By "on their own" I mean, they told me what costumes I had to make for them. Looking back, I am not sure which part of me making their costumes equates to being on their own but that's what a mother does. Maybe I should have dressed as an indentured servant? So I, the indentured servant, got busy and here were my tools. Orange t-shirts and a hot hot iron. 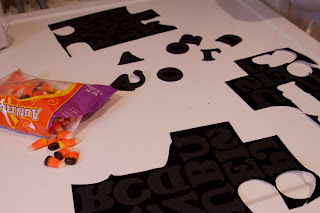 Velour iron-on letters and a bag of candy corn. 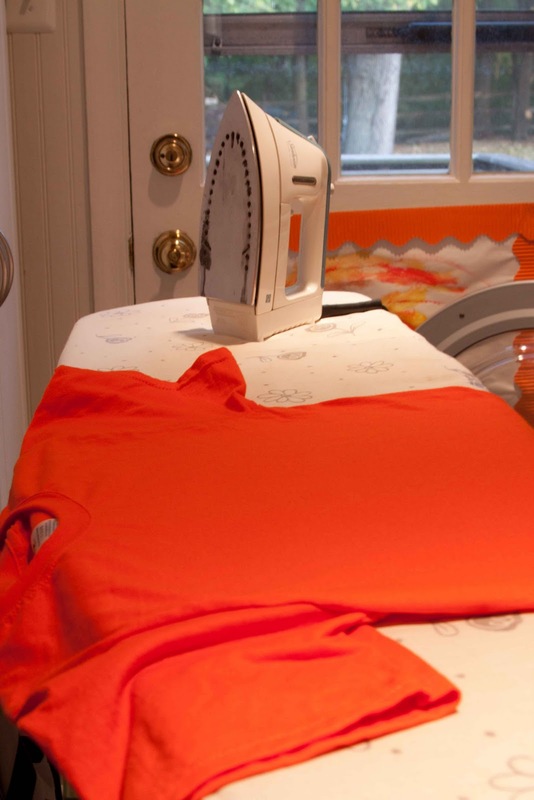 The candy corn has nothing to do with the costumes and everything to do with keeping me happy and vertical in the wee hours of the night while I ironed on FORTY-FOUR individual letters on the TWO t-shirts. But I'm not complaining. I was happy to see my two Percy Jackson clones, happy in their costumes. Happy because they really were dressed like themselves...t-shirts, jeans, the hoodies that they donned for Trick-or-Treating. 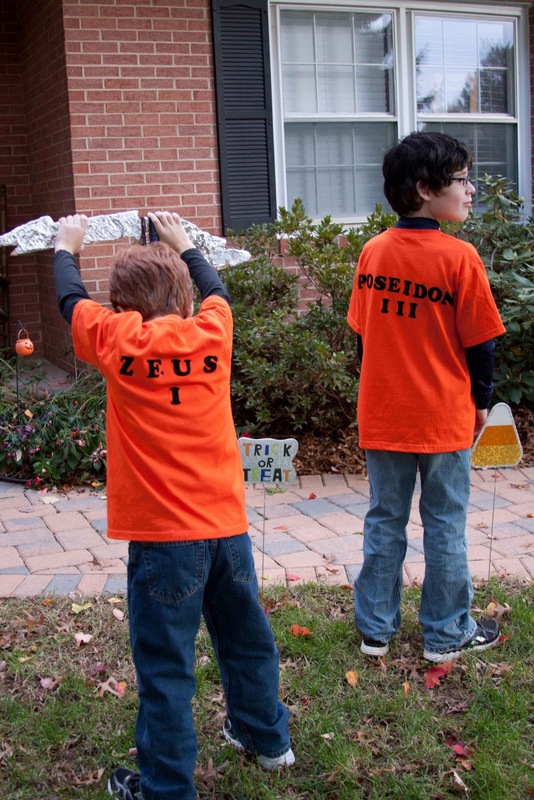 Perfect costumes for my boys who don't like to draw too much attention to themselves. The Lightning Bolt was an extra touch. You can tell which one was into the role a bit more than the other. Even with the lost Survivor photos, the failed idiot idiom costume and boys dressed like...boys, we still got copious amounts of candy and tons of fun with our neighborhood friends. I can't believe there is no Survivor photo! I'm with you on Thanksgiving. Come on Christmas (or rather Christmas retailers)...wait your turn! I love your costume, but,no, I didn't get it until you explained it! What a great idea! Blessing in disguise -- LOVE IT! One year I dressed like an airplane pilot, but with palm fronds on my cap. I was a palm pilot! The same year (the Gore/Bush election year) Mark wore a suit with felt numbers and equations on it -- fuzzy math. Someone else dressed as a pixie with a necklace of sweet-n-low packets -- she was diet sprite. I love them, even when I don't get them right away! That said -- NO ONE could have made a better Trelawney than you, though! I love the blessing in disguise idea!